Azmin greeting PKR members present at tonight’s PKR Sarawak dinner. 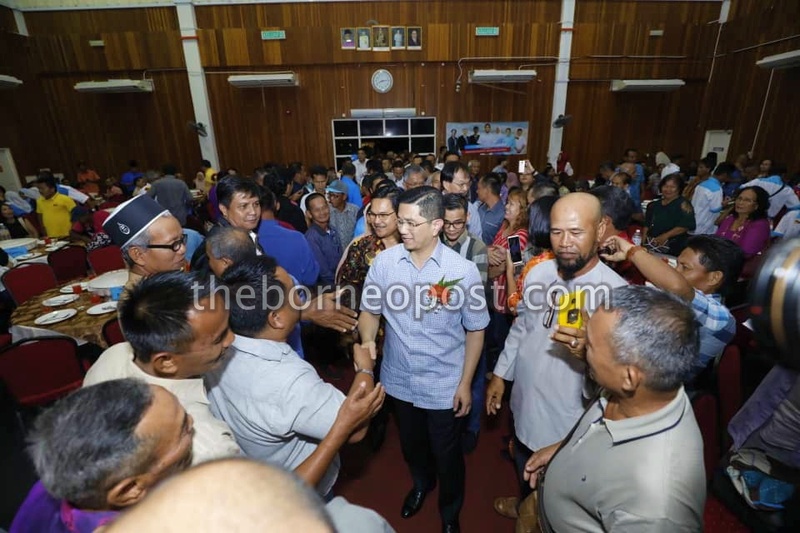 KUCHING: Minister of Economics Affairs Datuk Seri Azmin Ali who is the deputy presidential candidate of Parti Keadilan Rakyat (PKR) advised members not to fall prey to money politics. “Do not rely on the towkeys (the rich) and play money politics in the party election,” he said. He then congratulated the Malaysia Anti-Corruption Comission (MACC) and the Police for probing allegations and continuing investigations on alleged instigators and corruptors. He said this when officiating at the PKR Sarawak dinner held at the Youth and Sports Complex in Jalan Tun Ahmad Zaidi Adruce here tonight. Azmin who spoke in the run up to party election where he is the deputy president candidate, urged members to elect leaders who care for members. He said it is not wise to destroy the party and its struggle which they had built for more than 20 years simply because of the whim and fancy of the few power crazy politicians and those who are just very new to the party. He said PKR will not compromise with corruption. “We reject cronyism, nepotism and corruption,” he declared in his campaign trial. He urged people to give Selangau MP and Ba Kelalan assemblyman, Baru Bian, a chance to lead them via PKR Sarawak. He said Baru is a fighter, very committed and now that he is the Works Minister, he has greater power to serve the people. He then urged members to elect leaders who subscribed to the principle and spirit of reformation. The Sarawak government harboured the hope to collaborate with the Pakatan Harapan (PH) federal government, Azmin said, referring to his meeting with State leaders at the DUN this morning. Azmin said all ministries at the federal level will be on an austerity drive next year because of possible economic downturn and financial constraints but Sarawak will not be sidelined or shortchanged. And that is why Sarawak was allocated RM4.3 billion for the sake of its development in 2019, he added. Following the closure of his speech, PKR Sarawak chairman Baru Bian said supporting Azmin for the PKR deputy president is to support the unity of the party. Baru urged members to go to the ground and train others on how to e-vote so that come this Sunday (Nov 11), all will know what to do apart from coming early to vote. Also speaking at the dinner were elected representatives from Sarawak like Krian assemblyman Ali Biju and PKR Petra Jaya branch leader Nurhanim Mokhsen.